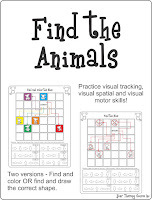 Need more visual spatial and visual motor activities? Check out Find the Animals. Summary: This download is a set of 10 activities that challenge visual spatial, visual tracking and visual motor skills. There are 10 find and color the animal activities or 10 find and draw specific shapes around the animal. Light Touch, Postural Sway and Children with Autism Visual Perceptual Printables for Thanksgiving – Freebie!